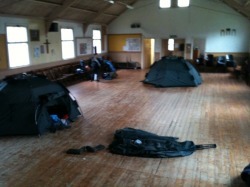 At 8.30pm on Saturday evening eleven Scouts and four leaders gathered at the Scout hut in preparation for a night hike. We travelled pitch black country lanes and fields eventually reaching the summit of Tandle Hill at about midnight. The view was spectacular, the city lights twinkling far into the distance. After a brief rest we headed down and returned to the hut. We set up tents in the hall and made supper. There wasn't much sleep that night! The following morning we made breakfast, packed away and hiked from the Scout hut to All Saints and Martyrs church in Langley for the St George's day service and parade. The good weather that we'd enjoyed for the night hike abandoned us and we marched down to Middleton Gardens in the rain. This was a challenging event and everyone did extremely well and should be proud of their achievement. On Friday fourteen Scouts met up at Ashworth Valley Scout campsite for what turned out to be a blisteringly hot weekend camp. We tried various different ways of starting fire and experimented with collecting water from leaves with plastic bags. The heat was almost unbearable and in the afternoon we hiked down to the valley and played in the stream to cool down. That evening every Scout made their own beefburgers with optional wild garlic picked from the woods. Sunday was too hot to do anything but shelter in the woods or down in the valley although there were a few impromptu water fights springing up here and there. At quite short notice we sent a small group off to take part in an abseiling event organised by 3rd Royton. 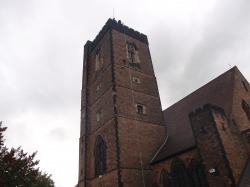 2 leaders, 3 Scouts and 2 Cubs braved the wind and occasional rain to abseil from the 120 foot high tower. A small group of us travelled to Blackhills Scout campsite just outside Bradford. The campsite was amazing, very heavily wooded and with excellent fire sites and a well stocked wood pile. Apart from a few visitors during the day we had the entire site to ourselves as we were the only group camping, 40 acres of woodland just for us! On Saturday we travelled over to "Another World" mountain boarding centre where we spent 2 hours learning to mountain board. 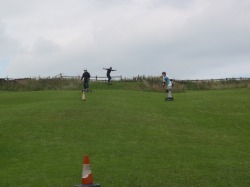 Everyone really enjoyed this and we all said we would defnitely do it again. When we got back we found that something had tried to chew it's way into our cool bag. Luckily it didn't get all the way through. That evening we cooked chicken with sliced potatoes, carrots, onion and apple in tinfoil packets in the embers of the fire. On Sunday we explored the woods and decided that Blackhills would be a good place to do a survival camp where we could make and sleep in shelters. Ten Scouts attended our Autumn camp. Some of the leaders headed down early to make a start putting the tents up but even so we were still setting up our camp in the dark. We could not find any dry wood to get a fire started so settled for cooking our hot dogs on the gas stove. Just after we went to bed at about 23.30 (which is VERY early for Scouts!) the rain started. It hammered down all night and didn't stop till morning. We stayed in our tents until 09.30 when the downpour turned to light drizzle. 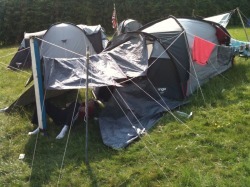 Two of the Scouts discovered they had set their tent up on a small ditch which had filled with a couple of inches of water overnight turning their tent into a swimming pool. We put up a tarp to keep the rain off the fire and cooked hash brown, egg and sausage in tinfoil packets. The rain was just occasional drizzle now so the Scouts headed off to explore the woods, they also discovered the marsh. One or two of them discovered it right up to their knees! Breakfast had been very late so we had sandwiches as a very late lunch. The whole camp had been invited to the campfire circle that evening. It was an excellent evening run by Cormack, one of the best campfire leaders any of us had seen. After the campfire we escorted the Cubs back to their accomodation then got our fire going and cooked "pizza chicken" for supper (chicken breast covered in pasta sauce, mozzarella, peppers, pepparoni and oregano all cooked in tinfoil with grated cheddar added once the foil packet was opened). While we were cooking supper the warden visited and somehow the conversation ended up with him telling us about an unsolved murder years before not far from where we were camped. Right on cue an owl hooted loudly above us and the Scouts all got very jumpy! Despite the killer never being caught we all survived the night and woke to a beautiful bright, but cold, Autumn day. We cooked our breakfast over the fire then played games in the woods. Too soon it was time to pack away the wet tents and get ready to be picked up by the coach.